It’s official. My planting season has begun! 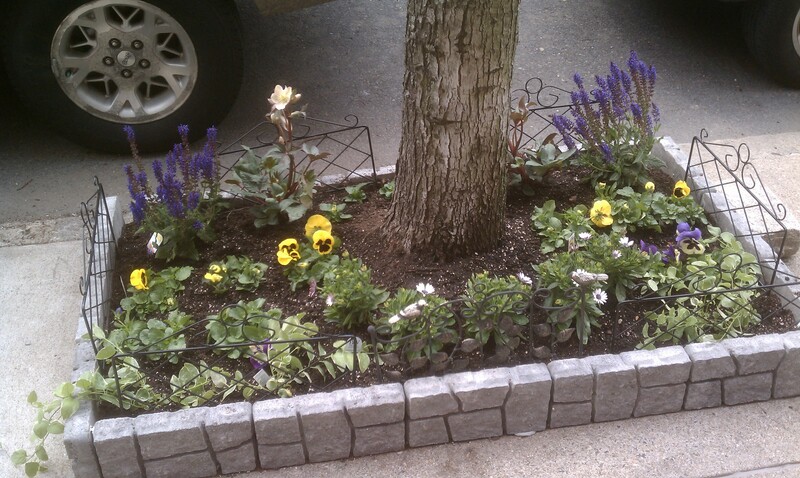 Every year on Patriot’s Day, I dig up my small street-side tree garden and start anew. I just love this time of year! and Heleborus Pink Frost with Delta Yellow Blotch and Maxim Blue and Yellow pansies along the sides with Osteospurmum (aka African or Cape daisy) in the front and vinca trailing on the two front edges. On Monday, it was colder than expected but perfect for gardening. 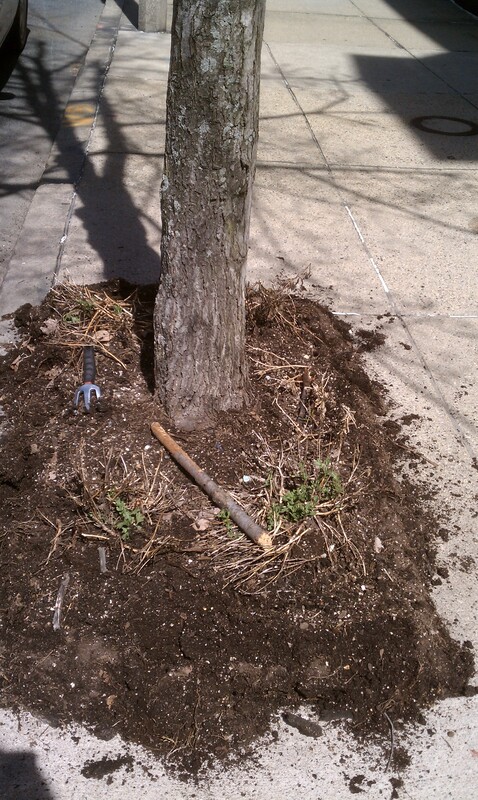 We did a complete overhaul, stripped out the old plastic edging, hacked our way through all the spidery tree roots (careful not to cut through feeder roots) and removed most of the soil. My husband deserves a round of applause for lugging and hauling four heavy bags of “yard waste” to various barrels on Commonwealth Avenue. Then the fun part began. We placed the concrete gray pavers ($1.54 a piece at Home Depot) around the garden and locked them into place with a putty type of concrete. My husband became expert at wielding the concrete application plunger aparatus. 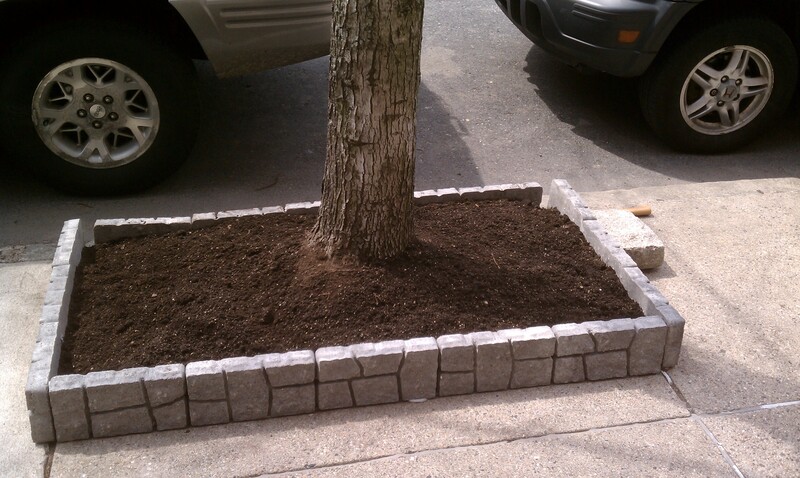 In hindsight, I probably should have waited until the concrete had dried more but I was anxious to get planting. 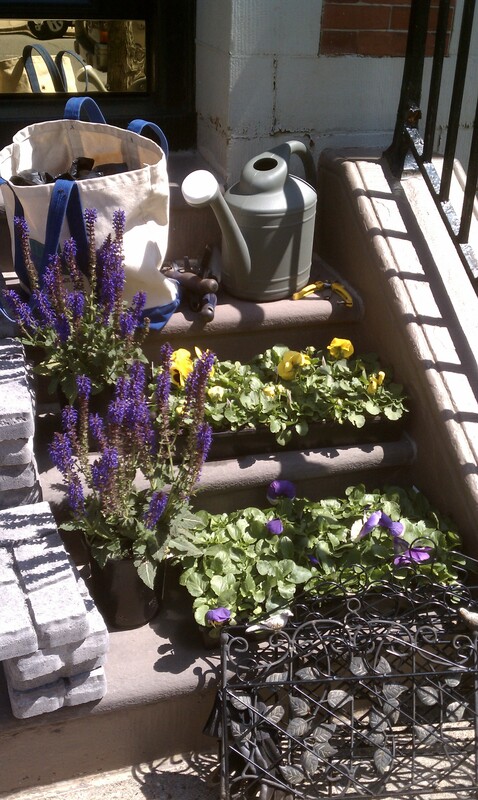 In went the flowers, with a little MiracleGro and water, as designed on the plot plan. It looks so great! For a final touch, on went the metal fencing. Lovely! You REALLY have it bad! Congrats to you and Dave for getting started so early. Love the Heleborus — noticesd them for first time at RI Flower Show. So pretty. So different. See you next week at the seminar!